On Thursday we’ll be part of the Big Give, a one-day fundraising blitz. Contributions to the department made during the Big Give will go directly towards supporting our students and faculty and keeping philosophy strong at Berkeley. 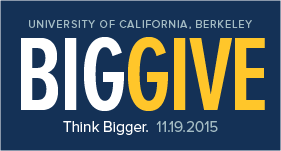 Visit https://philosophy.berkeley.edu/give on November 19 to show your support and keep Berkeley extraordinary!